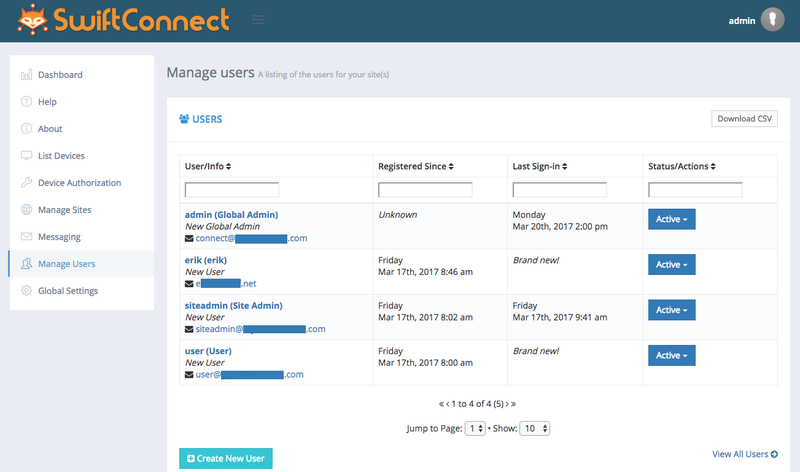 To create a user account, log in to your SwiftConnect℠ interface Administrator account. On the left-hand menu, click on Manage Users. Here you will see the list of all the existing user accounts on your Site(s). Scroll to the bottom of the of the screen and click on the blue Create New User button. A window will appear. Here you enter in the credentials for your user account. We suggest setting up all the user accounts you will need ahead of time, so when a new user registers, minimal changes need to be made by you or the property’s management staff. When creating usernames, be consistent. For example, we would recommend a username of “uv-100,” with “uv” correlating to the site name and “100” representing the unit number. For communities with multiple tenants per unit, we have used the the naming convention of “uv-100a” and “uv-100b,” etc. Each user account must have a unique email address associated with it. Use a stand-in email address until a legitimate one can be entered. For example: uv100@myswiftconnect.com, uv101@myswiftconnect.com, and so on. Enter in the number of devices allowed per user. Although you may want to discuss this with the property management, the number you choose should rely heavily on your knowledge of the probable number of users online as well as the bandwidth being routed into the network. The device allowance can be changed for individual users at a later date if needed. The Title will remain “New User” until the account is edited to enter in the user’s personal email address. Though not necessary, you may want to recommend changing the Title at that time to the actual name of the user (i.e. “Jane Doe”). This will help management staff keep track of outdated accounts and allow them to search by name. 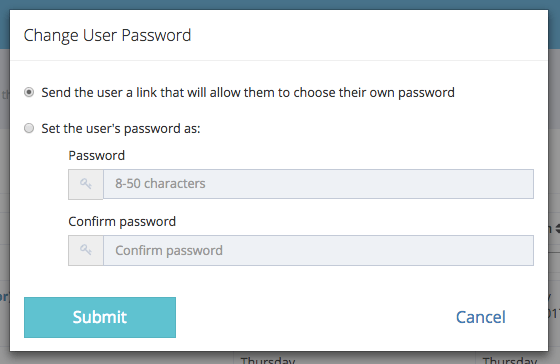 In order for the user account to be accessed, you must assign it to a Site using the drop down menu. Users not assigned to a Site will, essentially, not exist. When finished, click the blue “Create User” button. Once a user account has been created, it can be easily edited to include the personal information of the resident. To edit the account, go to your Manage Users section and scroll to the account you wish to edit or search for it in the blank space under User/Info. Once you find it, click on the blue Active button on the right to bring down the dropdown menu. Click on Edit User. This will bring up the user account information window. Change the email to the user’s personal email address and, if desired, update the Title to the user’s name. Once finished, click on the blue Update User button. Once you have updated a user account to include a user’s personal email, you will want to send them the invitation to create their own password. To do so, go to your Manage Users section and scroll to the account you edited or search for it in the blank space under User/Info. Click on the blue Active button on the right to bring down the dropdown menu. Click on Change Password. In the window that pops up, make sure that “Send the user a link that will allow them to choose their own password” is selected (it should be automatically). Then click Submit. You may resend a new link at any time. Sending a new link will cause previous links to expire immediately. 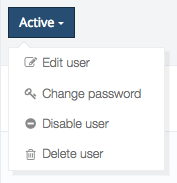 To delete a user, go to your Manage Users section and scroll to the account you want to remove or search for it in the blank space under User/Info. Click on the blue Active button on the right to bring down the dropdown menu. Click on Delete User. A window will pop up asking you to confirm or cancel your selection. If you would like to simply remove a user’s access to their account, change the email address associated with the account back to the generic one you created when the account was initially set up (i.e. uv100@myswiftconnect.com) or to the personal email of the new user who will now be associated with that account. Afterwards, send a Change Password command for the account. 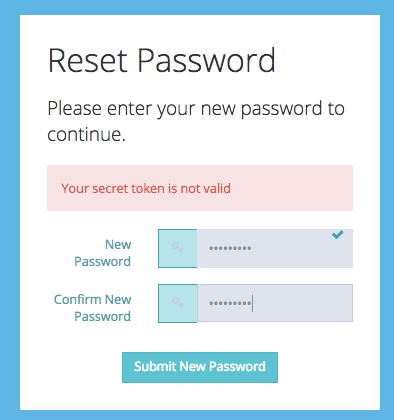 This will reset access to the account, allowing you to set it up for a different user without having to completely recreate it. You may also need to remove access to the devices associated with a removed/reset user account. To remove devices associated with a user who is no longer on the network, click on List Devices in the left-hand menu of your SwiftConnect℠ interface. In the search box, type in the username for the account in question. This will bring up all devices registered under that username. Click the red trash can icon to the right of the device to delete it from the network. If you have reassigned the account to a new user, they will also have the ability to remove these devices from the account once they log in to their Device Manager. To keep your interface tidy, remove devices that have been deleted by either you, management staff or the users themselves from the Device Manager. Go to List Devices, scroll to the bottom and click on the red Prune Devices button. Sometimes a user or member of the property management staff may be unable to add a device on their own. 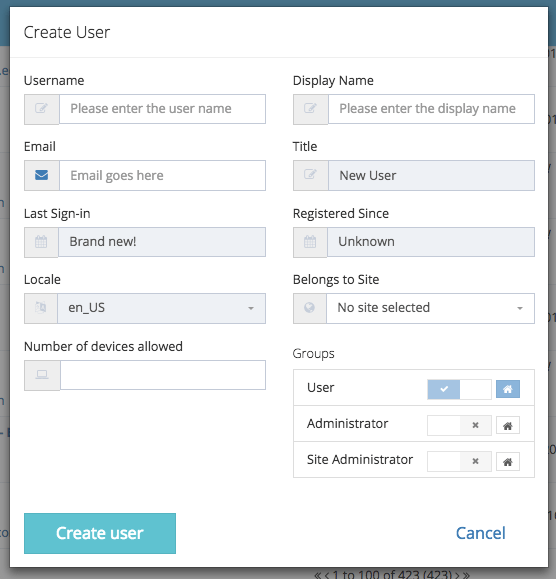 You may do so manually using the Device Authorization tab on your tab on your SwiftConnect℠ interface menu. 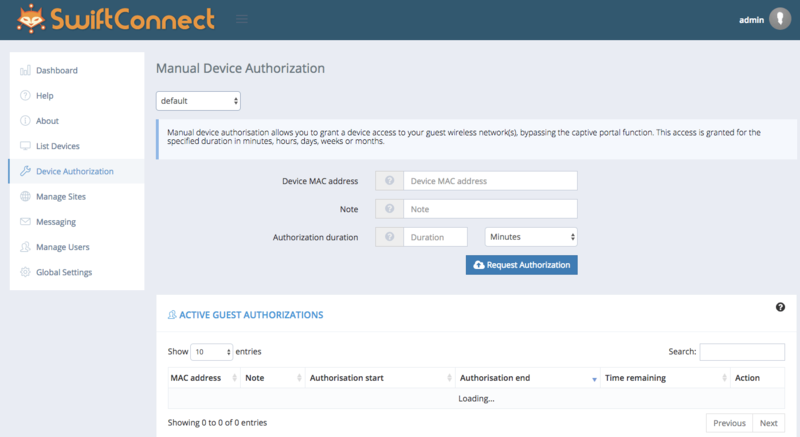 First, click on Device Authorization link in the left-hand menu of your SwiftConnect℠ interface. Select the Site you want to add the device to from the dropdown menu under the Manual Device Authorization heading. The page will populate with a list of the currently authorized devices on the network as well as an empty form field. In the form field, add the wireless mac address for the device as well as a “Note” to describe what you are adding, something along the lines of “Jane Doe #100 Xbox.” Finally, set the duration of the authorization. Unless otherwise instructed, we typically set authorization for 365 days. Lastly, click on the blue Request Authorization button. If all of the information is valid, the device will now be authorized. In order to make a transition to the SwiftConnect℠ Device Manager as simple as possible, we have created instructional materials for you to easily edit, print and provide to the property managers and users. These files will give them the instructions they need to access their Device Manager and manage their accounts. You will need Adobe Reader to edit the files. Download the Property Manager Instructions here. Download the User Instructions here.